Background: Apocynin has become a drug of choice in NADPH oxidase induced pathological conditions. Hyperoxaluria is one such pathological condition where NADPH oxidase is involved in eliciting renal injury. Objective: Recently apocynin has shown to reverse the transcriptome profile of the NADPH oxidaseassociated genes and reduced oxidative burden in hyperoxaluric animals. The poor solubility of this drug creates certain apprehensions about its bioavailability. 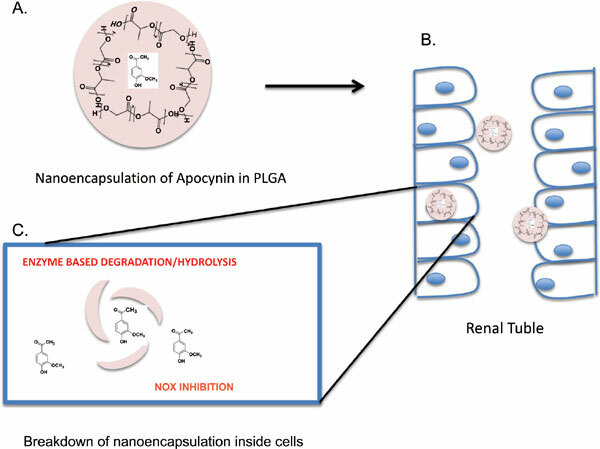 PLGA (Poly Lactic co-Glycolic Acid) encapsulation of drug nanoparticles have showed to induce sustain release and henceforth enhance the efficiency and bioavailability of drugs. Therefore, the present study is aimed to envisage a novel approach of synthesizing apocynin doped PLGA nanoparticles. Methods: The PLGA nanoparticles (both unloaded and loaded) were prepared using solvent extraction method and analyzed for size and stability by Dynamic Light Scattering (DLS), TEM (transmission electron microscopy) and zeta potential. Furthermore, the drug release and encapsulation efficiency of the drug was calculated in vitro. Results: The nanoencapsulation formed was stable with desired size (217-259 nm) and posses a controlled drug release of 20%. Further this nanoencapsulation was explored for its potential to reduce hyperoxaluric manifestations in rats given ethylene glycol with ammonium chloride for 9 days. Conclusion: In comparison to free apocynin, it was found that nanoparticles containing apocynin showed moderately better results in vivo by maintaining serum urea and createnine levels. These nanoparticles can be used in diseases where a sustained release of apocynin is required. Apocynin, hyperoxaluria, PLGA, nanoencapsulation, NADPH oxidase, kidney.